Manual Vs Automatic Sanitary Bins – Which Should You Choose? Whether you run a small office or a large shopping centre, providing means for safe and hygienic disposal of female sanitary products is essential. But with so many sanitary disposal options available, how do you know which sanitary bins are best for your business? These are simply sanitary disposal bins which are opened and closed by hand. Usually made from durable plastic material and used with a bin liner on the inside, they are a safe receptacle where female staff and customers can dispose of feminine hygiene products. They come in several shapes and sizes (including slimline options in order to fit into small toilet cubicles) and keep communal and public toilets hygienic and free from unpleasant odours. Manual bins are a perfectly acceptable option for the safe disposal of sanitary waste as long as they are well maintained and emptied regularly. The main difference between a manual and an automatic sanitary bin is the way in which the bin is opened. Due to the nature of the products that are stored inside, you may want to know how to open a sanitary bin without physically touching it. Automatic bins allow for exactly that. Automatic sanitary bins offer touch free operation which minimises the risk of cross-contamination and gives users peace of mind. Like the manual bins, an automatic sanitary unit must be well maintained and emptied regularly. Depending on the amount of female staff or visitors you have, this could be as often as every day. The main factor that will help make your choice is budget. Automatic bins tend to cost a little more up-front and are also costlier to maintain. Although most come with batteries that last a very long time, they will run out eventually. If this occurs in between services, users may not be able to operate the bin and sanitary products may end up on the floor or in the toilet bowl. To avoid this, automatic bins require more frequent monitoring than their manual counterparts. Automatic bins may cost a little more than manual bins, but they are often preferred by users as well as those who are tasked with emptying and cleaning them. 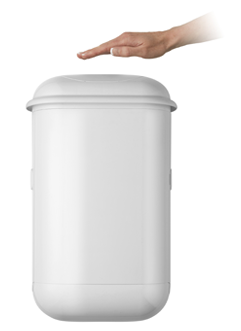 As users can operate the bins without touching them, automatic sanitary bins give users that extra peace of mind. If you are a customer-facing business or run an office that regularly has clients visiting, you may therefore wish to invest in an automatic sanitary bin for your customers’ comfort. Both types of sanitary bins are completely safe and hygienic if well maintained. Ultimately, your choice will come down to budget and the space you have. For advice on all of our sanitary disposal products or information on any of our other washroom products and services, give us a call and speak to one of our friendly staff today.